Having recently transitioned over to closed beta on steam, Dirty Bomb sets itself apart from other FPS titles with its flavorful mercenaries and objective based gameplay. 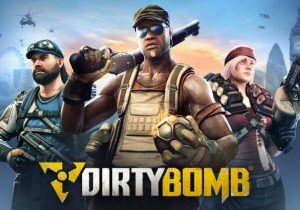 Dirty Bomb (once under the name Extraction) is a free-to-play multiplayer online first-person shooter (FPS), developed by Splash Damage, the studio behind Wolfenstein: Enemy Territory and Brink. Designed with a cooperative, team-focus in mind, players will be able to choose from dozens of unique roles and defend or attack key objectives. The game also boasts ECHO, an analytics and telemetry system, which will offer a fair playing field. The game is developed by Splash Damage and published by Nexon an is currently in closed beta on steam. Get more information about Dirty Bomb at the MMOHuts game profile HERE!